Sometimes you’ll find that your built-in flash unit isn’t cutting it for you. Maybe you can’t get the result you want with the built in unit. Or perhaps you have a Sony A7, and don’t even have a built in flash unit. There are just some situations where you’re going to need an external flash unit. Klik hier voor de Nederlandse versie van deze review op het blog van De Greef & Partner. If you have bought a mirrorless camera to reduce the bulk, or If you have a DSLR but don’t want to carry any more gear than absolutely necessary, buying a big and bulky flash unit doesn’t really make sense. 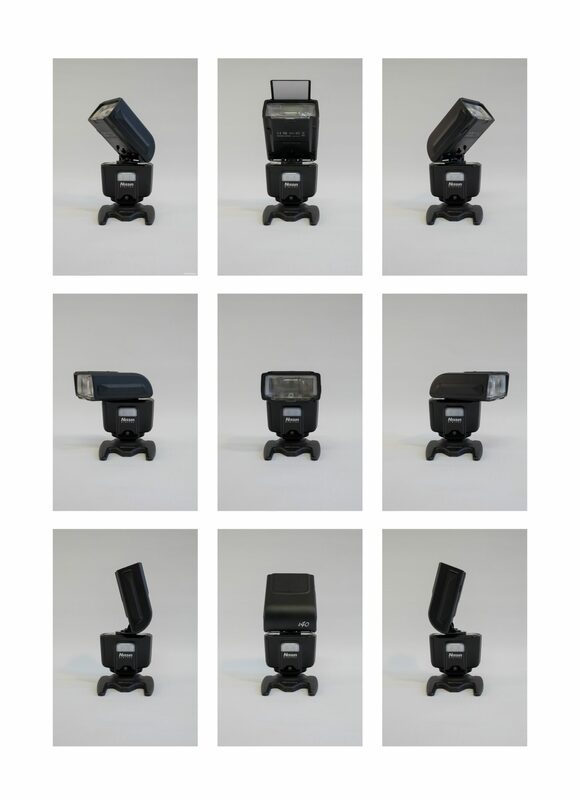 Most brands do offer smaller flash units, like the Sony HVL-F20M or the Nikon Speedlight SB-300. 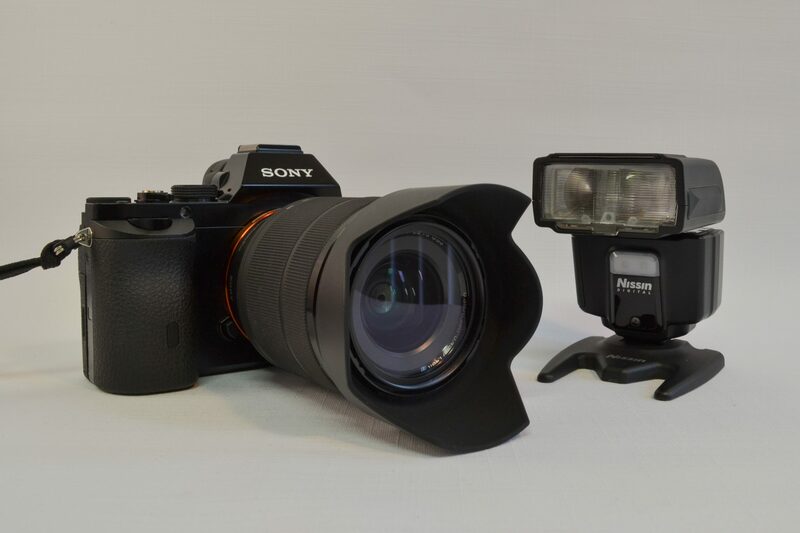 Both are nice and compact flash units, but they are a little limited in some ways. They have limited power, the head isn’t as flexible as more advanced units and you don’t have a lot of control over the flash. Nissin has got a very capable alternative, in the compact form of the Nissin i40. A compact, powerful flash unit with user-friendly controls and a lot of extras. Nissin builds several versions of the i40 that can be used with cameras from Sony, Nikon, Canon, M4/3 and Fuiji. In this review I’ll review the Sony version that I have tested with my Sony A7. There may be little differences between the different versions that are mostly caused by the capabilities of the camera you use. The Nissin i40 is sold in the Netherlands for about €239, all versions are priced the same. Nissin supplies the i40 with a wide variety of accessories. Besides the flash unit itself you’ll find a protective bag, carabiner (not for climbing), an omnibouce-style hood and a stand to put the flash on when you use it wireless. Most other flash units aren’t this complete. The first thing you’ll notice is how powerful the i40 is. A built in unit normally doesn’t go beyond guide number 10 to 12 (meters). The smaller units built by Sony and Nikon have guide numbers of around 20. The Nissin i40 outclasses them all with a guide number of 40. The flash is powered by 4 AA batteries. That helps the battery life, makes the flash charge fast but does make the unit quite heavy. With the batteries the flash weighs about 370 grams. The whole body of the unit is filled with those 4 batteries. Makes me wonder where they have put the electronics? Unfortunately it isn’t possible to use the flash with only two batteries in case of emergency, it will only work with 4 batteries. The head of the Nissin is adjustable in different directions with a sturdy feeling, metal mechanism. When you adjust the head it snaps in to place with a reassuring click, so the direction doesn’t change by accident. Horizontally the head is adjustable over a range of 180 degrees to the left and 180 degrees to the right. Vertically you can adjust it in 5 steps with a total reach of 90 degrees, making it possible to adjust it from horizontally to completely vertically. Of course it is possible to combine horizontal and vertical adjustments, so you can adjust the flash to accommodate almost every shooting situation. The best result is obtained by bouncing the light of the ceiling. When you are shooting a portrait you can use the built in reflectioncard to brighten up the eyes of your subject. Tough the Nissin’s body is very compact it still has a lot of extra’s. On the front you’ll find the built in LED-videolight, with two high power LED-lights. You can adjust the LED-lights power in 9 steps, from -2.0 to +2.0. The videolight is powerful enough to used when filming a subject that aren’t too far away (the maximum range is about 1.5 to about 2 meters). If you want to shoot subjects that are further away you’ll still need a dedicated videolight. Below the video light you’ll find the IR-sensor that is used for remote or slave use. Even lower you’ll find an AF-support light. The Sony A7 unfortunately doesn’t use this light as it uses the one built in to the camera body. The flash units head has got a built in reflectioncard that you can use to bounce a little extra light on to your subject when you have the head pointing upwards. Besides that it has also got a diffuser tucked away under the light. You can use that for (semi-) macro or close up photography to evenly spread the light. When you slide up the refelectioncard you’ll find you a summary showing the different colours the power LED turns when you use the manual zooming of the head. You’ll only need manual zooming when using the wireless option where you can’t use the wireless iTTL function or when you use a vintage lens that doesn’t send focal length information to your camera. If you have the unit attached to your camera with a native lens it can use the iTTL information to automatically zoom the head to match the setting you’ve chosen on your lens. On the back of the unit you’ll find the user-friendly controls. The unit only has got 4 controls. The power button, the release button you use to detach the flash from your camera, and two dials. Besides those controls there are 4 LED’s that tell you about the status of the unit. It’s got a multicolour Power LED (showing if the unit is on, charged and the manual zoom setting). Besides that there are three LED’s that show the manual or automatic modes and power adjustment settings. Controlling the unit is done by combining the two control dials. The smaller primary wheel is used to switch operation modes (like iTTL or Manual). The secondary wheel controls the power settings. In iTTL mode the power is adjusted in steps from -2.0 to +2.0. If you put the unit in Manual mode you control the output power in steps from 1/1 to 1/256th. Sd, slave digital, the flash reacts to other flash units while ignoring the pre-flash most digital cameras use. Sf, slave film, the flash reacts to other flash units that don’t use a pre-flash, like older film cameras or studio flash equipment. RMT-M, RMT-TTL and RMT-TTL 2 for wireless use. As you can see the i40 has got a lot of functionality, so it can adjust to almost every situation. Because of all the functionality It will appeal to both novice and more advanced photographers. Unfortunately my Sony A7 doesn’t have a built in wireless commander. So I didn’t get a chance to test the wireless TTL functionality. I did try the Slave digital remote setting, where the camera reacts to other flashes it detects. This worked like a charm, just make sure the unit can detect the flash of the other unit. It doesn’t even have to be in direct line of sight, and as promised the i40 didn’t get fooled by the digital pre-flash. The i40 works very good in tandem with the Sony A7. Despite it not being an original Sony flash unit I didn’t encounter any problems with the communication between the Sony A7 and the Nissin. If you zoom the lens on the A7 the i40 adjusts the zoom setting accordingly. With a zoom range of 24 to 105mm (35mm eq.) the i40 has more than enough range to use with most lenses. The camera recognizes the flash being attached, so it automatically adjusts the maximum shutter speed to 1/250th. 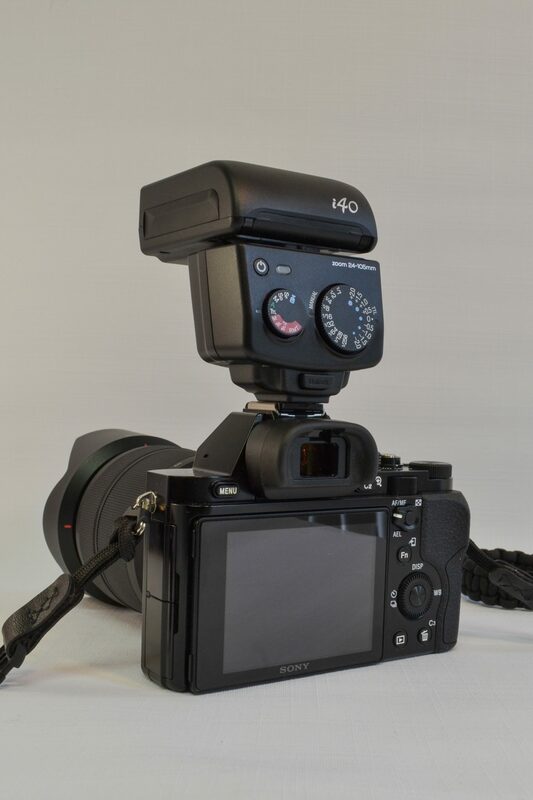 The i40 easily slides in to the hot shoe of the camera and locks its self. You don’t have to flip any handles. Taking it off is just about as easy. Just depress the release button and slide the unit backwards. I like this way of operation better than the clunky handle my old Nikon flash had. When using the iTTL setting for shooting subjects at a short distance the flash is a little too bright for my taste. That can easily be adjusted by using the power setting control dial. I like the result best when using the -1 to -1.5 setting, but that is mainly taste. At power setting 0 your subject is evenly lit and exposure is well controlled (no blowouts), I just like a more subtle look. Of course it is also possible to adjust the flash compensation in the camera menu, but using the wheel on the i40 is much faster and easier. When you use powerful rechargeable batteries you can use the i40 for hours on end without depleting the batteries. I use 4 2700 mAH Ni-MH batteries, with these the i40 has got a better battery life than my Sony A7. Using the rechargeable batteries the loading cycles are very short. Of course you can use the i40 with normal non rechargeable batteries, but those will deplete faster, so using rechargeable batteries is recommended. When using the i40 in iTTL mode it automatically goes in stand-by / power save after 2 minutes, in wireless mode it enables power save after 5 minutes. You can reactivate it by depressing the shutter release on your camera or by using one of the controls on the flash. The i40 has got an automatic overheating protection. I haven’t been able to activate that, not even after using the unit for long shoots. Probably because the flash almost never uses full power in iTTL mode. The i40 can use High Speed Sync, up to 1/8000th of a second. This means you can use the i40 when shooting fast shutter speeds, for instance when using it for filling in a shot in bright sunlight. The maximum standard flash sync depends on your camera. My A7 supports sync up to 1/250th of a second. 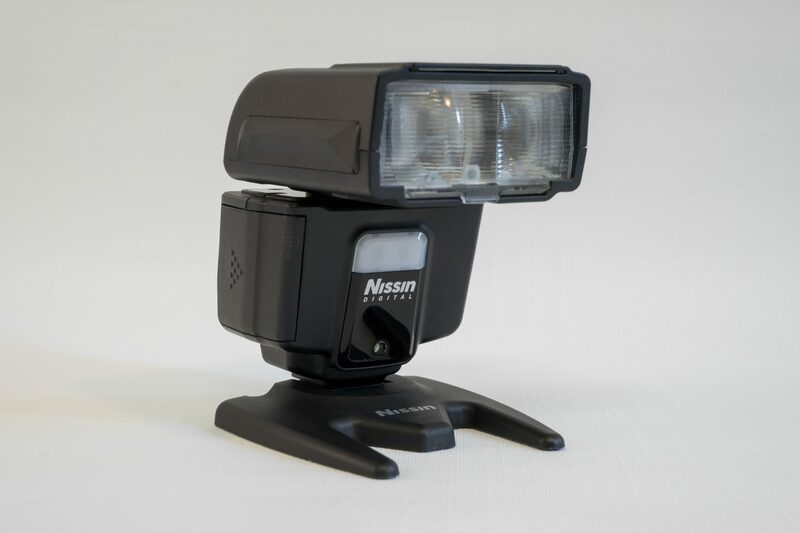 The Nissin i40 is a fantastic little flash unit. Its compact, powerful and has got all kinds of wireless modes. Besides that it is affordably priced, original flash units with the same power and functionality are often a lot pricier and don’t come with as much accessories. 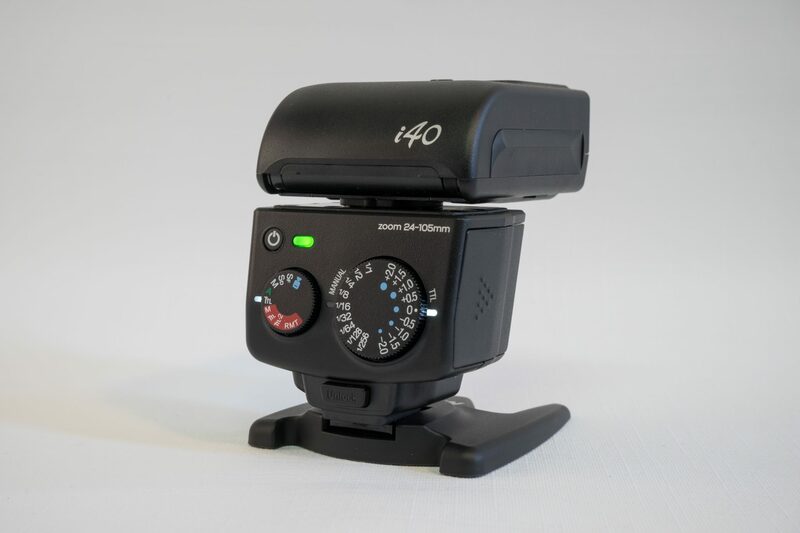 The i40 is a great addition to your gear. It’s got user-friendly controls but still packs lots of functionality so that it can be used by novice photographers but it won’t disappoint more advanced users. Interested in the i40? Buy one using one of the following affiliate links and help me keep my blog online: Bol.com (Netherlands), Amazon.com or Amazon.de. I’d like to thank Degreef & Partner for supplying me with the Nissin i40 for this review. Degreef & Partner is the Dutch importer of Nissin, Lowepro and other high end photo brands like Joby and B+W. If you want to know more about Degreef & Partner, please check out their website (in Dutch) at http://www.degreef-partner.nl/. For more information about the Nissin use this (also in Dutch) link: http://www.degreef-partner.nl/nissin-camera-flitsers.html. Or check the international Nissin site: http://www.nissindigital.com/i40.html. Great review, very helpful. Many thanks for all your efforts. I’m thinking of getting the Nissin for use with my Sony A7R Mk II so this was useful information. Thanks for your reply! The Nissin offers a great quality for its price. Ps. Have fun with the A7R II, looks like the greatest camera of 2015! Would this flash be compatible with the Sony A6000? 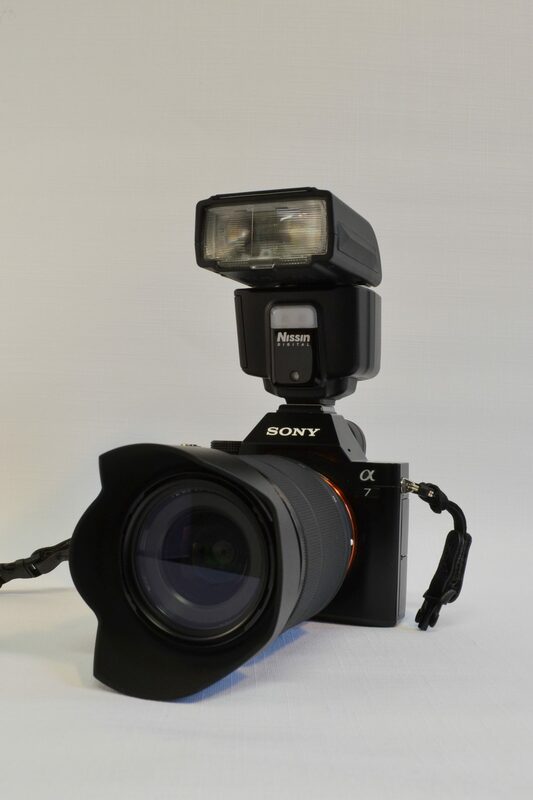 Also, why would you recommend this flash over the Sony HVL-F43M? Hi Jason, the Sony version of the i40 does work with the A6000, so that isn’t a problem. And it works very well, so I wouldn’t buy a Sony flash if it is more expensive than the Nissin. Especially since the Nissin is very compact but still powerful. As far as I know the Nissin is just as compatible with your A77II as it is with my Sony A7. Since the difference between the Nissin and the Sony is small (besides the price) I woudn’t know why anyone would choose the Sony over the Nissin. I for one was very impressed by how well the Nissin works and integrates with my Sony camera, I didn’t find any compatibility issues. Rick, thank you for your detailed review. You made it clear and uncomplicated, too, making it for non-techies like me easy to understand. Thank you. Hi Anna, thanks for the kind words! As for your question, as far as I know both Canon and Fuji use an ISO-hotshoe so in theory the Fuji Nissin i40 will fit and will fire when you use it on your Canon. There are two things to keep in mind. First: you don’t get any automation using the Fuji flash on your Canon (no TTL) so you would have to set the desired output manually using the ‘M’ setting on your i40. The second is a little more complex, you should check if the trigger voltage of your Canon camera and your Nissin flash for Fuji are compatible. If they aren’t you could damage your camera or your i40, so you should check that before trying. I think Nissin will be able to tell you if that will work. I do know using a Nikon flash on a Sony camera will work (also without automation), but I don’t know about mixing Canon and Fuji. Good luck and enjoy your Nissin i40! So glad you said to check first with Nissin before trying it on my Canon. I almost did! Thanks, Rick, for valuable advise. Opps, one question. I bought it for my FujiXT1, can I use it for my Canon Mark III? Hi Rick I have a Sony A7 and the Nissin i40 flash. Can I use the flash off camera. Do I need some kind of adaptor or wireless remote. If so would you recommend any. Thanks . The Sony A7 doesn’t have a wireless commander built in to the body, so you will need the Nissin Air 1 commander and the Nissin Air R receiver. 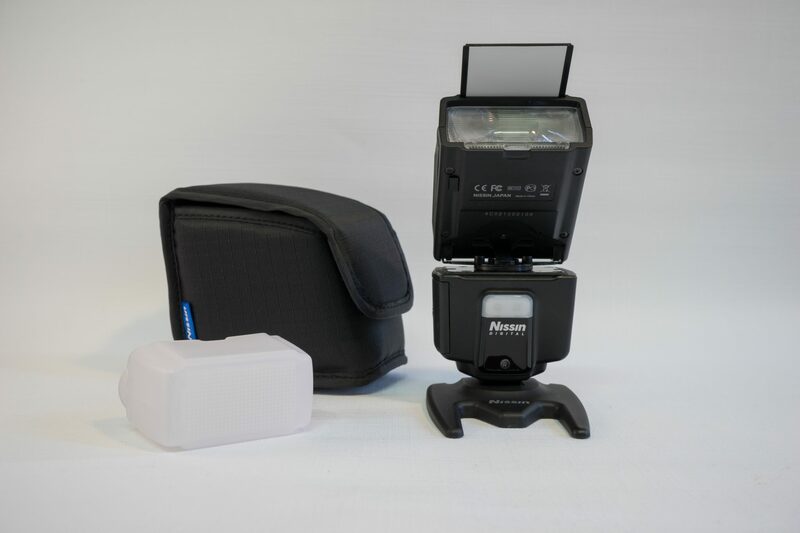 You can mount the i40 on the Nissin Air R and use the Air 1 commander on your camera to control the i40. The upside is that the Air 1 and Air R aren’t really expensive and they offer p-TTL and even HSS. So you wont miss any functionality. There is some extra information about the Nissin Air System (NAS) in my review of the Nissin i60 Nissin i60 review by Ricksreviews. Hope that helps! Hi Rick, Spoke earlier re Sony A7 to Nissin i40 flash and using it off camera with a Nissin Air Commander set-up Transmitter and receiver. I’ve used the i40 on the Air R myself, so I can assure it will fit and work perfectly. Just make sure you buy the Sony version of the Air R. Maybe the person that wrote that it doesn’t fit bought the wrong Air R with an other mount.